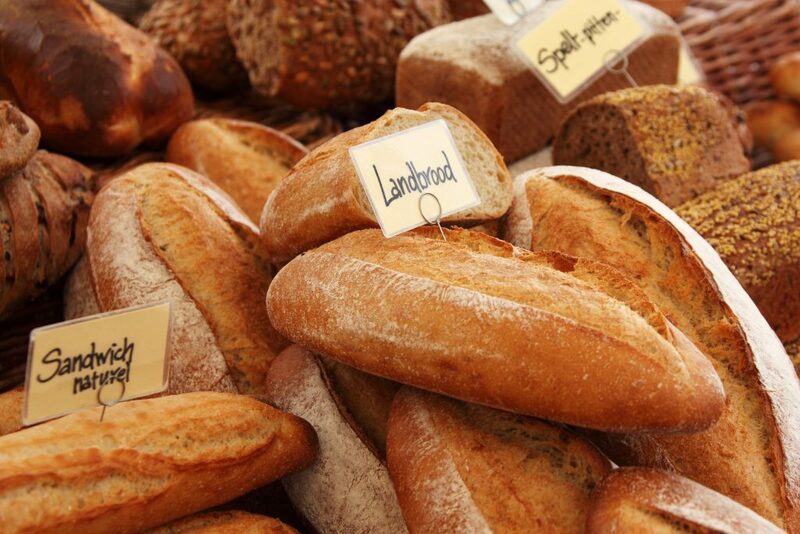 Carb lovers unite, we all love a bit of bread, but the big question is: what is the best bread for weight loss? 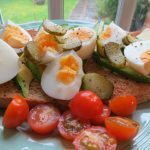 If you have tried and failed miserably at a ‘low carb’ diet then don’t fear, you are not alone. I tried too and all it did was make me lethargic and low on energy. Plus I seriously missed bread. Now I know there are still diets knocking around that claim reducing carbs can be beneficial, but it’s not for everyone. It’s important that the way we treat food is realistic, so let’s face it, we can’t just go cutting out bread for good. This considered, we should still make good choices with the bread we choose to eat. But what is the best variety to keep off the pounds? Here are my top three. In case you didn’t know, Rye, or ‘Pumpernickel’, is a German bread made using ground rye and a sourdough starter. That is the big difference, as the loaf you and I know well is made with wheat and yeast. The benefits of substituting your normal slice with some rye is that it will keep you fuller for longer as it’s got far more fibre. Not only this, when compared to an average slice of white bread, rye fairs better in terms of calorie count. It’s got a different taste and texture, but I really like it. I toast it on high so it is really crunchy, then you can add what you like. As a topping, peanut butter with bananas is one of my favourites. Wholewheat, you can pick it up in all supermarkets big and small, and unlike rye, it’s pretty similar to the nations favourite white loaf. It looks and feels pretty similar, it’s just brown instead. Wholewheat bread is made, you guessed it, by using the whole of the wheat. The benefits of this are that the bran and wheatgerm give an extra hit of fibre. Great for digestion and for keeping you full up! I initially grew up eating white bread but made the swap to wholemeal years ago. I’m so used to it now that I can really tell the difference if I’ve eaten white instead (which is basically that I get the munchies pretty quickly, boo!). So if you know you aren’t going to have time for lunch, maybe pop some wholemeal in the toaster for breakfast to keep you going for longer. Granary bread is packed full of added whole grains. Usually the bread itself will be made with wholewheat flour too, so the fibre content will be high which is super good for your digestive system. Wholegrains are complex carbohydrates, which your body relies on as a primary source of energy. Focussing on foods that are nutritionally superior will make you less likely to need a snack in between meals. So if you are a bread lover it is definitely worth picking up some yummy granary bread to make your sarnies with. It’s got far more going for it than your doorstop white loaf. So there you have it, three options that you don’t have to feel guilty about. Superior taste, more nutrients and keeps hunger in check, what’s not to like? For those of you watching your waistlines it is a no brainer. If you are sighing at the thought of leaving behind those white rolls and doorstop wedges then check out my recipes section for a few ideas that might enthuse you. I have toast for breakfast every weekend and crunchy rye is simply devine. Have I mentioned peanut butter on rye is like my favourite thing ever? …*Trails off into peanut butter day dream*. 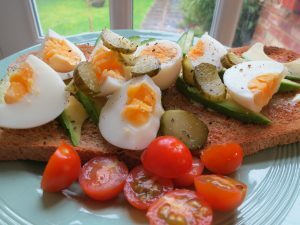 It’s a dreary morning in the British Isles and I am ravenous after a run, so what better than eggs and avo on toast? My fridge is usually half empty by the time the weekend is finished but thankfully have got my staples. Eggs. Avo. Bread. (Okay, so I am a sourdough lover but today no such luck, I have bakery wholemeal, good enough). There’s no messing around with this brekkie, you can stick with the basics or jazz it up as you like. My boyf likes to mash the eggs up with pepper and mustard so it’s more like a spread. I am not so inventive mind you. I cover the toast with thinly sliced avo, chunks of eggy goodness on top and then I get chopping with whatever I have left in the fridge. Today we have baby tomatoes, cucumber and gherkins. Yum. This is super filling and will definitely keep you going until lunch. I had this over the weekend too which was a lifesaver when I was off out to a lunchtime wine tasting afterwards (crikey, day time drinking anyone? It’s a killer!). Full of good fats and the creamy avocado negates any need for buttering your bread (I mean, you can if you like though..). 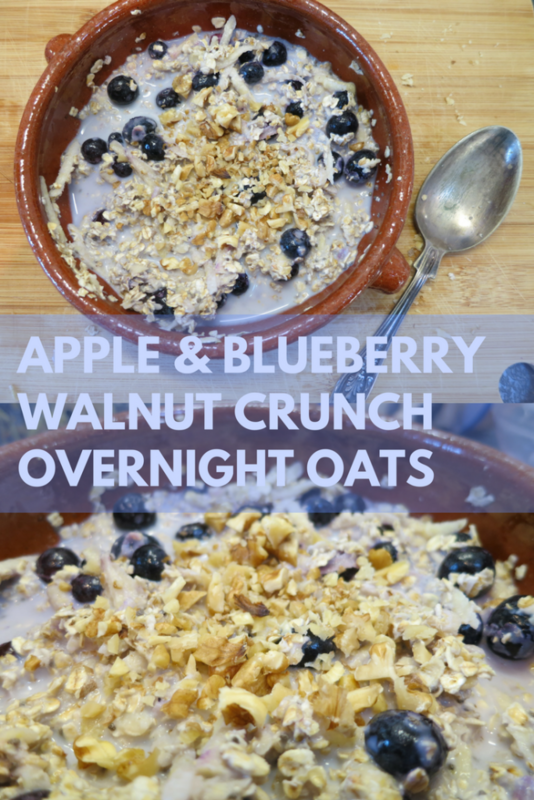 Such a wholesome breakfast and so easy to whip up. It’s one of those recipes that is almost not even a recipe. But I’ve attached it below just in case you need some steps. A simple combo packed with protein and fats. Healthy, tasty and good for kitchen-phobics. Once your eggs are done, tip out the boiling water from the pan and replace with cold water. Once cooled start to peel the eggs, put your bread in the toaster as you do this. 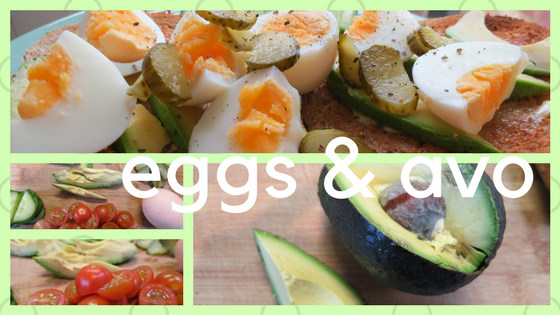 Once all the eggs are peeled and your toast has popped it's time to assemble, put the sliced avocado on the toast, chop the eggs and chuck ontop. Garnish with your extras, I served mine with cherry tomatoes, sliced gherkins and cucumber. Give a generous shake of salt and pepper then get stuck in. 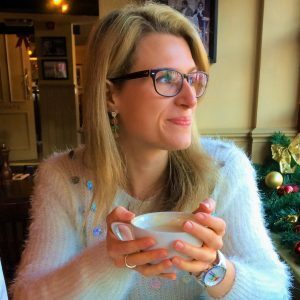 Inspired by this ladies plight to spend less, or in fact, spend nothing, for a whole year, I am looking at how we can all benefit from spending less and living more. 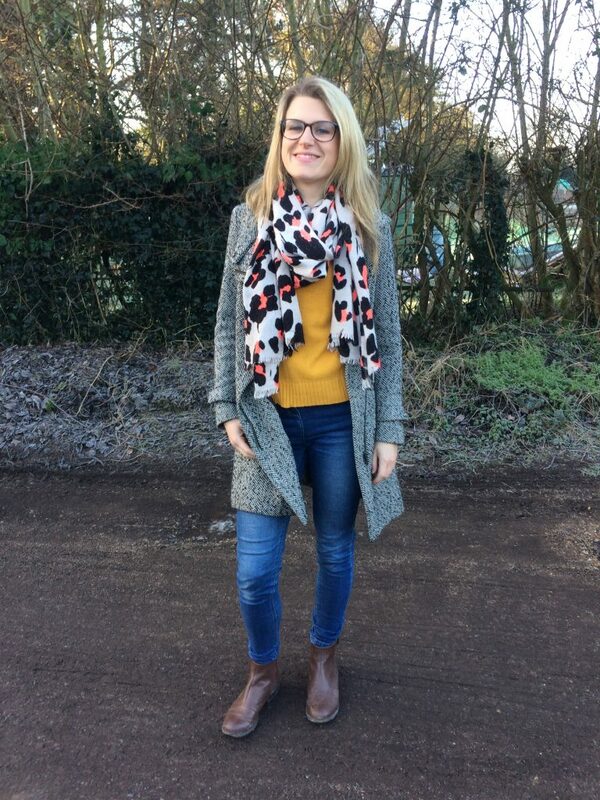 I’m not going to lie, the reason I started this post is because I live in a teensy cottage and have soooo many clothes (and shoes, and bags..) that my boyfriend is forever nagging me that we haven’t got enough space. He’s right, but during my clear out, it did get me thinking..
We are all guilty of spending too much and on stuff that we probably didn’t know we even needed. A well placed advert appears whilst scrolling through the internet one minute and there you have it, a full trolley on Asos the next. We are constantly reminded to spend at every corner. On the TV it is more advertisement than actual content. When I read the sunday suppliment in the paper there are pages dedicated to flogging us the latest cream or a smelly candle that costs upwards of £40.00. The big companies are good at making it look as though you need to buy something. They focus on human pyschology to hook you and give the illusion that your life will somehow become better and more enriched from buying their products. What are we actually getting out of it? We are getting stuff, obviously. We’re also feeling that buzz of having something new which is exciting. But, we are also losing space in our homes, money in our purses and worst of all excess consumerism is contributing to pollution. According to the World Resources Institute fast fashion has allowed us to consume more. “The average consumer is now purchasing 60% more clothing in 2014 than in 2000, but each garment is kept for half as long”. Now that can’t be a sustainable way for us to live. I know when I was doing the rounds at the shopping centre I wasn’t thinking about the environmental impact of the top I just bought from a fast fashion retailer, but I will now. What could happen if we stopped? Spending less could not only save you a load of cash, it will help the environment also. Making a small change like re-thinking where you buy your clothes can help make an impact. Second hand shops and vintage markets are a good start. Even if that doesn’t appeal to you, you can make a start by ensuring to recycle your unwanted garments. Big companies have already started to take responsibililty and H&M have introduced a garment collecting initiative in their stores, so you really have no excuse! So, I’m not saying I’m going to go all out and spend nothing, but I am certainly going to give it a good try and implement some new tactics in my life to help reduce my impact on the planet. It’s also been really nice to have more space at home. 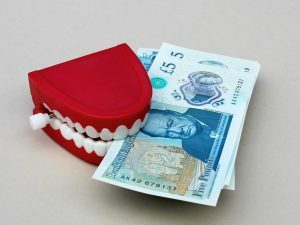 Like us all, I get attached to my clothes and stuff, but queue some mass-ebaying and the little cash injection every time I sell an item and I am convinced. I have still got a full wardrobe with lovely stuff in it, so I really don’t need anything else. I’m not going to get drawn into ‘fast fashion’ this year. Spend less & live better is definitely my new motto! I’ve gone a bit oat-mad this week. 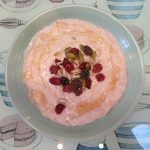 Maybe it’s because I haven’t been shopping so it leaves little else as a breakfast option, but also I just love making hot and creamy porridge oats to have on the coldest of mornings. If you have to go out and scrape all that ice off your car you might as well do it with a belly full of goodness. Trust me, it does warm you up too! When I was working an early shift I had to get up and go so quickly that it required microwaved porridge, which I think is never quite as nice. But if you must, you can make this recipe and save time by microwaving. I always recommend microwaving it for no longer than 2:00-2:30 mins and then leaving it to stand for a while before eating. 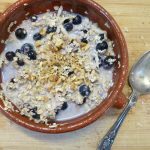 It makes it the perfect temperature to eat but also allows the oats to soak, when you mix them, they should become a nice thick but not gloopy consistency. I had been nuking my breakfast in the microwave and creating gelatinous blobs for ages before I thought to reduce the cooking time. So anyway, this recipe is doing it the traditional way in a pan on the stove. 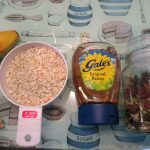 I always like to have banana with my porridge, I chuck it in with the oats whilst they are cooking as they soften and the sweet flavour mixes into the whole dish. The browner the banana the better. It’s also another great way of sneaking fruit into your kids diets if they are stubborn. Once cooked, I dress the bowl up with a squeeze of honey and some dried fruit & seed mix, but you can use whatever you like. My friends like to have theirs with a blob of peanut butter in the middle. 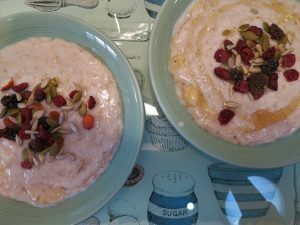 The thing I love about porridge is that you know exactly what you are putting into it. 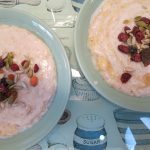 I see on the shelves so many prepared versions of porridge oats, where they profess to have fruit and all sorts of enticing things mixed in already, for your convenience, but the fact of the matter is that most of them also have a considerable amount of sugar added also. Plus, no freeze dried fruit is ever going to be as good really! 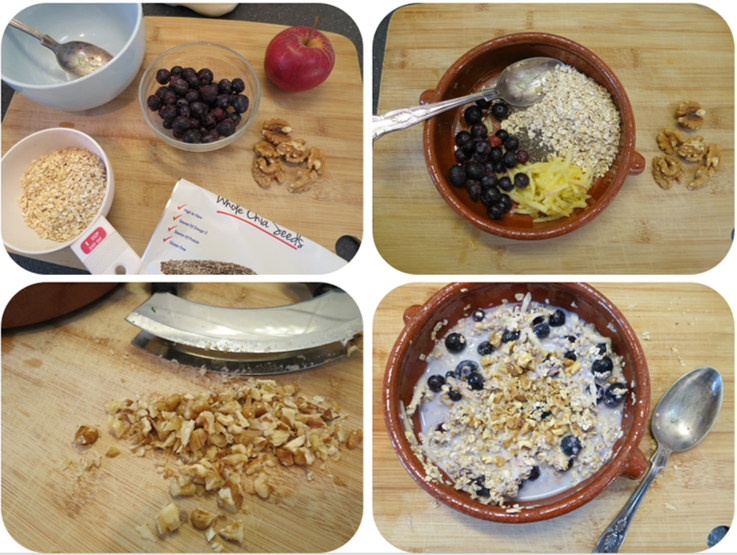 A healthy, warming bowl of porridge oats to start off your day. The fresh banana chunks cooked in make this a super sweet and satisfying breakfast classic. Chop up the banana and measure out the ingredients. 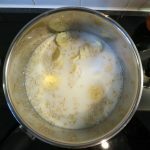 In a pot combine together the oats, milk, water & banana chunks. Turn heat up to medium and give a quick stir. 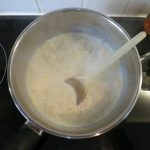 Let the oats cook for 5-10 minutes, stir only occasionally otherwise the oats will become gloopy. When the mixture has absorbed most of the liquid and is steaming, take off the heat and serve into two bowls. Add your favourite toppings and enjoy! Let me just start by saying breakfast is not only the most important meal of the day, it also happens to be my favourite meal of the day. Nothing quite beats the sip of your first cup of coffee followed by a nice fruit filled breakfast. I am actually a sweet tooth breakfast person, so this ‘Shakshuka’ thing, I’ll be honest, despite the fact it sounds great and I’ve seen it many a time on café menus, it’s not what I would usually go for at breakfast time. But my boyfriend is the opposite, he loves all things savoury, plus we had some eggs in the fridge that just had to be used so I though, hey why not give it a go. Shakshuka is something that we can thank the Arabs for introducing, it’s essentially eggs cooked over a rich and spicy tomato sauce. Which, let’s face it, is far more exciting then a greasy fried egg! Plus you get an injection of vitamin goodness from the veg based sauce. 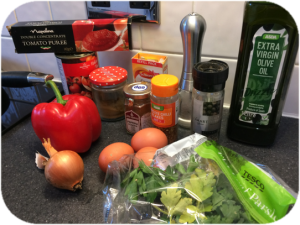 I’ve included my recipe below but you can add your own variations, some people prefer to use fresh tomatoes, and can be a great dish to cobble together with any leftover veg, it doesn’t necessarily have to use bell peppers. I think next time around I am going to add a spoon of harissa spices in to add that Tunusian zing I love! It’s good to take your time over the base of the dish, I like to add my spices in to cook off and release the flavour before I put any of the tomatoes in, but you might have your own methods. It’s a great dish to improvise with as you just need a few spice cabinet staples, a tin of tomatoes and some veg to go with your eggs. Prepare all the ingredients. Peed and dice the onion, de-seed the pepper and chop into small cubes, peel and crush the garlic. Stir in the cumin, paprika, smoked paprika and cayenne spices and leave to cook for a minute or so. Leave this to simmer now for 10-15 minutes, dependent on whether you want your eggs runny or cooked through. Lift the lid and now it is time to dish up! Separate in half and serve on two plates, garnish with the fresh parsley and spring onion. I like to serve with a clob of bread to mop up the delicious tomatoey sauce at the bottom! 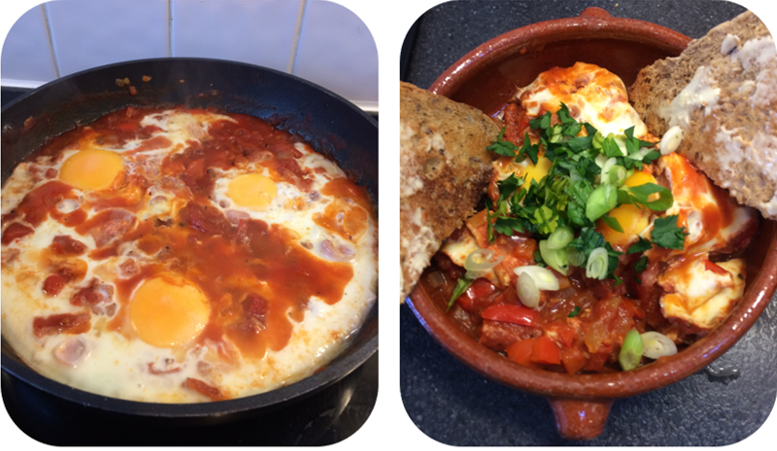 The shakshuka went down a treat with the other half and I’m definitely a convert, although I think I’d be more inclined to have it for lunch. PS: I know it’s supposed to be served straight up from the pan! But hey, it was just us two at the table so I went all portion-up with it, sorry purists!